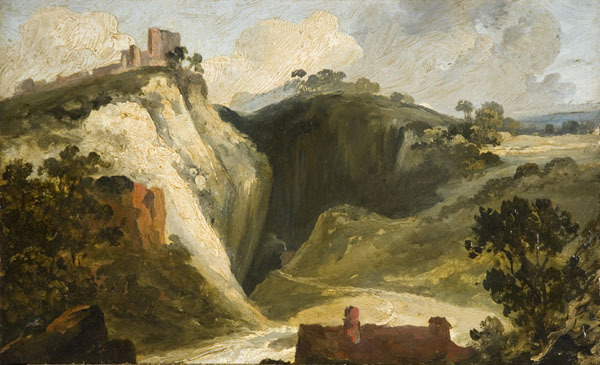 Summary: Oil painting showing the mouth of a deep cave within a green landscape. On the top of the peak the ruins of a castle are visible. Description: The bold, loose brushwork in this painting is quite different to Muller's usual fine finish. 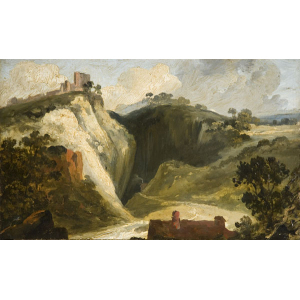 It could be that this work is a preparatory sketch, or deliberately free and unfinished in manner to reflect the scraggy landscape of Derbyshire. Peak Cavern is located just west of Peveril Castle, Derbyshire. The mouth of the cave is the largest in Britain. Inside the cave mouth you can clearly see signs of habitation by rope makers, who used the caves to live and work for centuries .In the distance is the dramatic ruins of Peveril Castle perched on a high hill above the village of Castleton. The stronghold, formerly known as Peak Castle, was built by William Peveril around 1080.